I live in Lafayette Indiana with my husband Jim. I have a studio and exhibit my work in Thorntown near Lebanon North of Indianapolis. I became fascinated with watercolor a few years ago. Since that time it has been my passion. 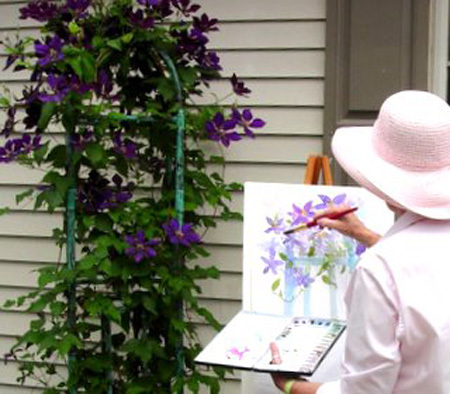 I am drawn to landscapes and flowers, but will paint any subject that sparks my interest. I am inspired by the play of sunlight upon a subject and the way it creates interesting shadow patterns. My travels to Paris, Barçelona, Venice, Israel, Greece, and Egypt have been an inspiration for many of my recent paintings. I thank God for my painting ability and pray that I may continue to grow as an artist. I am proud and honored to be a resident artist and I maintain a studio in the Sugar Creek Art Center which has become my second home.